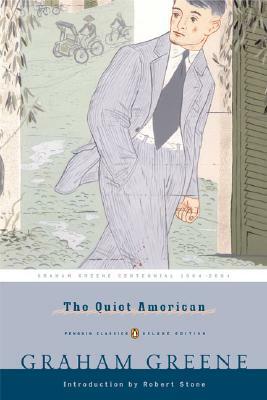 "I never knew a man who had better motives for all the trouble he caused," Graham Greene's narrator Fowler remarks of Alden Pyle, the eponymous "Quiet American" of what is perhaps the most controversial novel of his career. Pyle is the brash young idealist sent out by Washington on a mysterious mission to Saigon, where the French Army struggles against the Vietminh guerrillas. As young Pyle's well-intentioned policies blunder into bloodshed, Fowler, a seasoned and cynical British reporter, finds it impossible to stand safely aside as an observer. But Fowler's motives for intervening are suspect, both to the police and himself, for Pyle has stolen Fowler's beautiful Vietnamese mistress. Originally published in 1956 and twice adapted to film, The Quiet American remains a terrifiying and prescient portrait of innocence at large. This Graham Greene Centennial Edition includes a new introductory essay by Robert Stone. Graham Greene (1904-1991), whose long life nearly spanned the length of the twentieth century, was one of its greatest novelists. Educated at Berkhamsted School and Balliol College, Oxford, he started his career as a sub-editor of The Times of London. He began to attract notice as a novelist with his fourth book, Orient Express, in 1932. In 1935, he trekked across northern Liberia, his first experience in Africa, recounted in A Journey Without Maps (1936). He converted to Catholicism in 1926, an edifying decision, and reported on religious persecution in Mexico in 1938 in The Lawless Roads, which served as a background for his famous The Power and the Glory, one of several “Catholic” novels (Brighton Rock, The Heart of the Matter, The End of the Affair). During the war he worked for the British secret service in Sierra Leone; afterward, he began wide-ranging travels as a journalist, which were reflected in novels such as The Quiet American, Our Man in Havana, The Comedians, Travels with My Aunt, The Honorary Consul, The Human Factor, Monsignor Quixote, and The Captain and the Enemy. In addition to his many novels, Graham Greene wrote several collections of short stories, four travel books, six plays, two books of autobiography—A Sort of Life and Ways of Escape—two biographies, and four books for children. He also contributed hundreds of essays and film and book reviews to The Spectator and other journals, many of which appear in the late collection Reflections. Most of his novels have been filmed, including The Third Man, which the author first wrote as a film treatment. Graham Greene was named Companion of Honour and received the Order of Merit among numerous other awards. Robert Stone is the author of seven novels: A Hall of Mirrors, Dog Soldiers (winner of the National Book Award), A Flag for Sunrise, Children of Light, Outerbridge Reach, Damascus Gate, and Bay of Souls. His story collection, Bear and His Daughter, was a finalist for the Pulitzer Prize, and his memoir, Prime Green, was published in 2006.